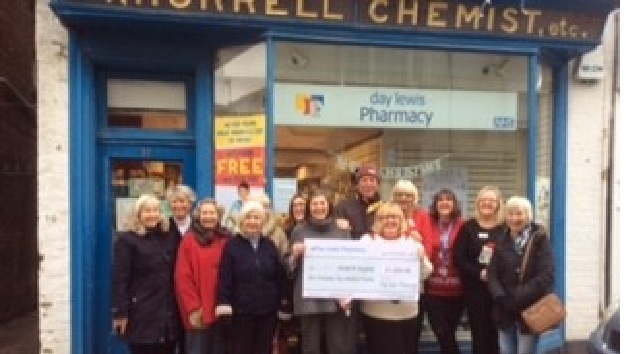 The charity, Here To Help (H2H), has received a generous donation from Day Lewis Pharmacy. The Rye branch in the High Street, held a successful charity collection day in June and this event was then “match funded” by the Day Lewis management. A total of £1,200 was subsequently donated to H2H to help to continue this voluntary service, which was presented on December 10 2018. They are extremely grateful to Day Lewis Pharmacy for this donation and to their staff for all the effort and energy they put into making the fundraising day so successful. Here to Help was started by Paddy Coulman in 2012, under the auspices of the Rye, Winchelsea and District Memorial Hospital, to support people at home after discharge from hospital. It is a support scheme for patients when they come out of hospital and may need a few weeks of additional help and also for local people who are housebound, recently bereaved, receiving outpatient care and the lonely. The general aim of Here To Help is to “be a good neighbour”. Today, Here to Help remains a local voluntary service, run under the auspices of the hospital, for people who live in the Rother parishes of Iden, Playden, Rye Foreign, Peasmarsh, Udimore, Icklesham, Camber, East Guldeford and Rye. More than 500 requests for assistance have been carried out by the H2H volunteers since it started and many of the requests are for help to attend medical, clinical or health appointments. They are currently recruiting volunteers who live in the above parishes and who would like to help people in their local community. Further details about H2H are available on the volunteer section of the Rye Hospital website. For more information and an application form, please leave a message on the H2H answerphone: 01797 224044. All Volunteers are DBS checked and expenses are paid. To be able to access the Here To Help service please contact 01797 224044. A trained volunteer will follow up your request. Image Credits: Here to Help.